The Char-Griller company was making low-priced charcoal grills and smokers for years before it began manufacturing and selling gas grills. 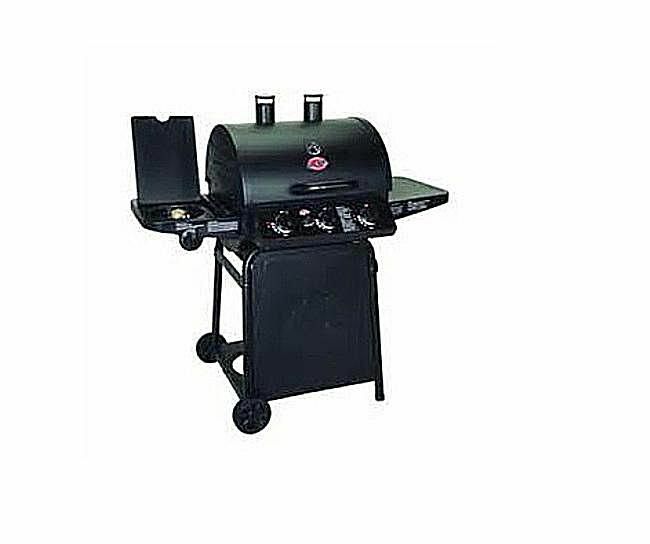 This offering, the Grillin' Pro 3001, is a gas grill is built on the modified body of the smallest of their charcoal grills. Its design basically replaces the coal grate with three gas burners. In addition, this model has integrated a 12,000 BTU side burner. This hybrid design makes for a much heavier gas grill, since the chassis is the same heavy thermal painted steel body and porcelain-coated cast iron cooking grates found on many charcoal grills. Surprisingly, though, low-price gas grill works quite well. Char-Griller has developed a good reputation for making charcoal grills and smokers in the lower price range. Normally, the bodies of charcoal grills do not work well when adapted to gas grills, and vice versa, but in this case, Char-Griller managed to make a good hybrid. This gas grill can produce good heat and hold it, partly because of the porcelain-coated cast iron cooking grates and the relatively heavy steel body. Many low-end gas grill manufacturers have moved to thin sheet metal bodies, but this one has enough thickness to hold in heat to sear steaks and cook at high temperatures. Although it looks a little unusual, this is actually a fairly conventional three-burner gas grill with a supplemental side burner. The nearly 41,000 BTUs heat output from the main burners may seem a little low for the 498 square inches of primary grilling space, but the weight of the cooking grates and the barrel shape tend to make up for this. With a smaller cooking chamber volume, it requires fewer BTUs to achieve good heat. You also get a good side burner that is powerful enough to do some pretty heavy cooking on. Of course, you are likely paying well under $300 for this grill, so it unrealistic to expect high-quality components or an exceptionally long life for this unit. But if you don't have a lot of money to spend, the Grillin' Pro 3001 from Char-Griller is a model you should consider.